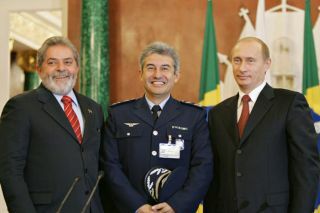 Brazilian astronaut Marcos Pontes poses for a photograph with Russian President Vladimir Putin (right) and Brazilian President Luiz Inacio Lula da Silva (left) after the two countries signed a space agreement in Moscow on Oct. 18, 2005. Brazil'sfirst astronaut will launch toward the International Space Station (ISS) inMarch 2006 under an agreement with Russia's Federal Space Agency, Russian spaceofficials said Tuesday. Lt. Col.Marcus Pontes, of the Brazilian Air Force, is slated to ride up to the ISSaboard a Russian-built Soyuz spacecraft with the crew of Expedition 13 under anagreement signed Tuesday between the Federal Space Agency and Brazilian SpaceAgency (Agencia Espacial Brasileiria). "TheBrazilian cosmonaut's flight has been set for late March 2006 at the insistentrequest of Brazil, which failed to launch its cosmonaut under a program of theNational Aeronautics and Space Administration (NASA)," said Federal SpaceAgency chief Anatoly Perminov, according to Russia's Interfax News Agency. Pontes, 42,reported to NASA's Johnson Space Center in Houston, Texas in 1998 to begin astronauttraining. He served with the Space Station Operations Branch of NASA'sAstronaut Office while awaiting a spaceflight assignment, according to NASAofficials. In astatement posted to their space agency's website, Brazilian space officialssaid Pontes will carry about 33 pounds (15 kilograms) of scientific equipmentinto orbit on his 10-day flight, and conduct a series of experiments beforereturning to Earth with the Expedition12 crew. He has already reported to Russia's Star City for cosmonauttraining and will spend eight days aboard the ISS, they added. Expedition12 commander Bill McArthur and flight engineer Valery Tokarev boardedthe ISS on Oct. 3 and are expected to spend at least six months in space beforereturning to Earth aboard their Soyuz TMA-7 spacecraft in early April. Perminovsaid Pontes' flight will cost about $20 million, though the final price willdepend on how busy his program will be, Interfax reported. "Theprogram has not been confirmed yet," Perminov said according to Interfax. Under thejoint agreement signed by Perminov and Brazilian Space Agency president SergioGaudenzi, Russia and Brazil will also cooperate in the development of future rocketsand satellites, as well as ongoing work on the country's VLS-1 launch vehicle,Brazilian space officials said.